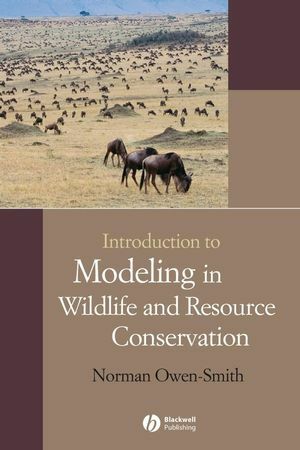 This book provides students with the skills to develop their own models for application in conservation biology and wildlife management. Assuming no special mathematical expertise, the computational models used are kept simple and show how to develop models in both spreadsheet and programming language format. Norman Owen-Smith is Research Professor in African Ecology in the School of Animal, Plant, and Environmental Sciences at the University of the Witwatersrand in South Africa. He teaches ecology at undergraduate and postgraduate levels, and is well-known internationally for his research into all aspects of wildlife ecology and bioresource conservation. 1 Introduction: why learn modeling?. 1.2 Structure of the book. Supporting file on the CD. 2 A starting problem: conservation of the dodo. 2.2 Conservation of the dodo. 3 Descriptive models: choosing an equation. 3.3 Geometric and exponential growth. 3.4 Adding a population ceiling. 3.8 Depensation or Allee effect. Programs on the accompanying CD. 4 Structured population models: age, size, or stage. 5 Consumer–resource models: population interactions. 5.5 Ratio-dependent intake response and time frames. 6 Simulation models: assessing understanding. 6.2 Adding density dependence to an age-structured model. 6.3 Aspecific example: the kudu model. 6.5 Generalizing the model for other species. 7 Harvesting models: adaptive management. 7.2 Principles of “maximum sustained yield”. 7.3 Surplus production model accommodating environmental variability. 7.5 Policies for setting the harvest quota. 7.7 Stock-recruitment models for fish populations. 8 Population viability models: risk analysis. 8.3 Environmental variability and catastrophes. 9 Metapopulation models: spreading the risk. 9.2 Basic patch incidence model. 9.3 Correlated migration and extinction. 9.4 Variable patch size and spacing. 9.5 Source and sink populations. 9.7 Examples of vertebrate metapopulations. 10 Modeling infectious diseases: outbreak dynamics. 10.3 Cyclic outbreak dynamics: measles. 10.4 Slowly spreading sexually transmitted disease: HIV–AIDS. 10.5 Controlling the spread of wildlife diseases. 11 Scenario models: exploring options. 11.4 Modeling the white rhino–grassland system. Program on the accompanying CD. 12 Vegetation models: biomass to gap dynamics. 12.2 Seasonal biomass dynamics of vegetation supporting herbivores. 12.3 Size-structured dynamics of a tree population. 13 State transition models: habitat patch dynamics. 13.3 Managing savanna vegetation for livestock. 13.4 Spatially explicit grid model. 14 Habitat suitability models: adaptive behavior. 14.2 Shifting habitat use by overwintering geese. 14.3 Habitat suitability for a browsing antelope from vegetation composition. 15 Reconciling models with data: statistical diagnosis. 15.3 Diagnosing the causes of antelope population declines. References to ?Sheet4? should be changed to ?Sheet1?. The first two lines should read: ?by the proportion of green leaves consumed plus the conversion coefficient from brown leaves times the proportion of brown leaves . . .? All line numbers indexed by $ signs, referring to fixed parameter values, should have these line numbers incremented by 5 to eliminate reference to the non-existent line number 0 in column I. In addition, in column H, ?I$1? should be changed to ?I$2? (incrementing it be 5 then makes it ?I$7?). In column A, ?A0? should be changed to ?A10?.